Golra Sharif Railway Museum, also known as Pakistan Railways Heritage Museum, is a Railway Museum located near the Sector E-11 of Islamabad, the capital of Pakistan. 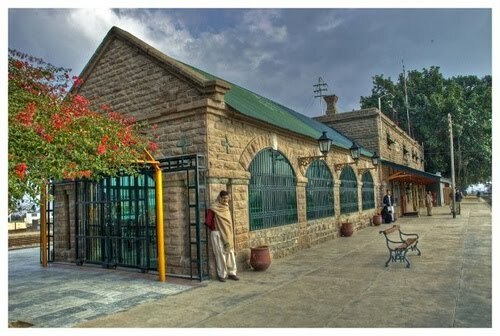 It is a junction station in Rawalpindi Division of the Pakistan Railways, located at 1,994 feet above sea level, in the southeast of the Margalla Hills and east of the cradle of Gandhara civilization, the ancient city of Taxila .This railway station is the site of a venerated Railway Museum housing the relics and memorabilia associated with railways dating back to the days of the British Raj. The Railways station with its museum is a major attraction for tourists and locals alike. The Railway Heritage Museum was established in October 2003. From Relics dating back to the inception of railways in the subcontinent by the British to memorabilia depicting the creation of the museum are housed and preserved in this heritage site. The Rail Heritage Museum is housed in three different halls to contain artifacts reflecting history of Railway over a period of more than 150 years including almost 100 years of undivided India. As a part of the museum there is a big yard where cranes, trolleys, saloons, locomotives, coaches and tracks are marshaled impressively, portraying the railway’s march forward through time.